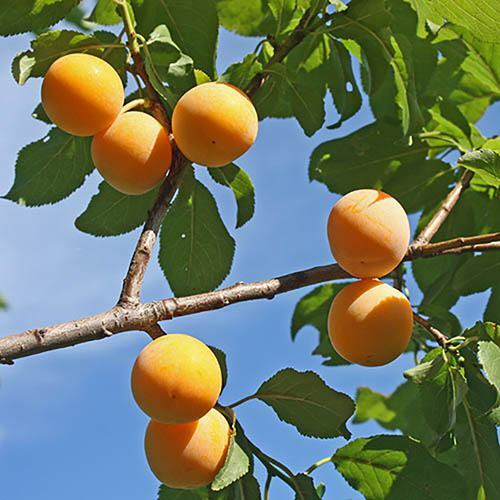 Grow your own plump, juicy plums and eat them straight from the tree! Firm, aromatic flesh, packed full of sweet juice - perfect for eating fresh, cooking or freezing. An abundance of attractive, golden-yellow, red-specked fruits late in summer. Supplied as a 1.2m tall, pot grown tree.Grown on dwarfing St Julien A rootstock and self-fertile. Will grow to approx. 2.5-3.5m (8-12ft) in 10 years. Fully winter hardy. Originally grown in France in the mid-19th century, and often known by it's French name 'Reine Clauide d'Oullins', the Oullin's Golden Gage is a great garden variety for anyone to grow. This self-fertile variety prefers warmer weather than apples or pears, so it will fruit later each year, producing its attractive, golden-yellow, red-specked fruits in abundance in late-summer. Very much sweeter and juicier than typical plums,a real sweet treat fresh from the tree. There is no greater pleasure than picking a plump, juicy plum straight from your own tree and popping it in your mouth! The firm, aromatic flesh is packed full of sweet fruitiness and the juice will fill your mouth, truly delighting your tastebuds! If you can resist eating them all, these versatile fruits are perfect for use in cooking or freezing for later. Supplied as a 1.2M tall, grower quality, multi-branched pot- grown tree. Grown on dwarfing St Julien A rootstock, and self-fertile. Will grow to approx. 2.5-3.5m (8-12ft) in 10 years. Fully winter hardy.